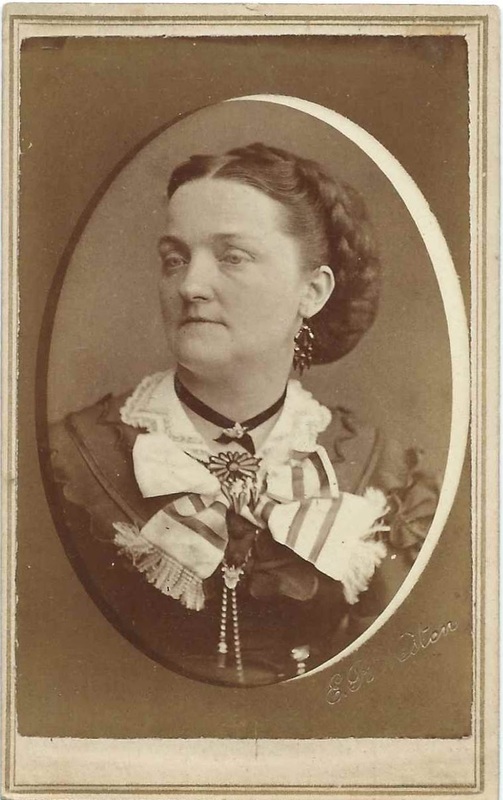 Carte de Visite of a woman identified on the reverse as Mrs. Quimby of Bangor, presumably Bangor, Maine. 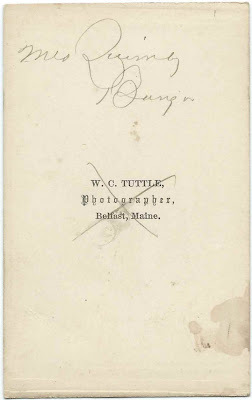 The photograph was taken by the studio of W. C. Tuttle of Belfast, Maine. For some reason, someone crossed out the studio imprint, as you can see below. 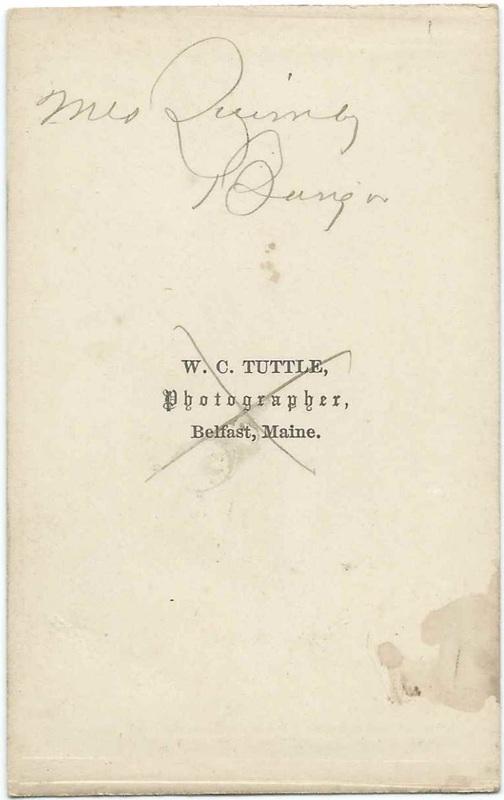 Perhaps Tuttle had a Bangor location. Annie (Brown) Quimby, wife - or by then the widow - of Dexter B. Quimby. If so, the CDV must have been produced shortly before her death in 1881. Annie Brown was born about 1834, possibly at Harmony, Maine. I haven't found her parents, and I don't know if Brown was her maiden surname. She married Dexter B. Quimby on August 15, 1857 at Bangor, Maine. Annie and Dexter had several children, before Dexter died in 1870. Annie married John Cram in 1875; he may be the John C. Cram who died in 1880 and is buried at Mount Hope Cemetery at Bangor, Maine. Also buried at Mount Hope Cemetery are Annie T. (Brown) Cram, who died in 1881; her first husband Dexter B. Quimby and other family members. Mary E. (Perry) Quimby, born about 1836, wife of Andrew E. Quimby, son of James and Abbie (Furbush or variant) Quimby and a brother of Dexter B. Quimby. Mary was born about 1836, possibly the daughter of John H. Perry of Bangor, Maine, and died in 1889. Delia W. (Gilbert) Quimby, wife of Elijah D. Quimby, a farmer at Bangor, Maine. Delia died in 1892 and is buried at Maple Grove Cemetery at Bangor, Maine, as are Elijah and three of their children, who died young. Helen M. (Gilman) Quimby, wife of Edwin Somerfield Quinby or Quimby. Helen was Helen Maria Gilman, born in 1829, daughter of Stephen and Lydia Osborn (Kendrick) Gilman. Emma A. (Dillingham) Quimby, wife of Herbert Quimby and presumably the daughter of Frederick Dillingham. Emma was born about December 1843. If you recognize Mrs. Quimby from your family photographs or research, please leave a comment or contact me directly.